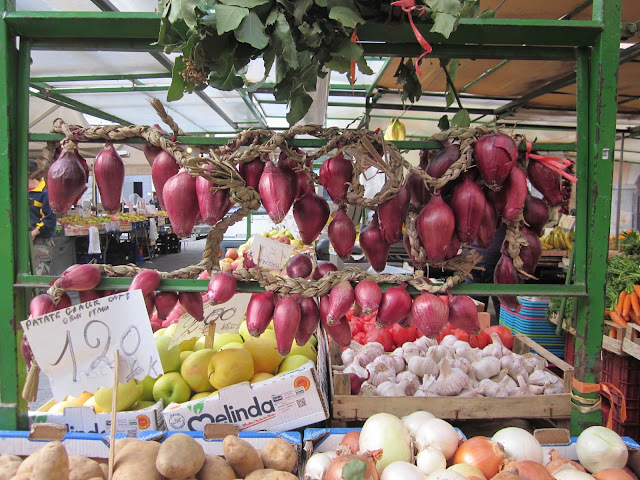 CHIAVARI, Italy - The daily produce market in Chiavari’s Piazza Manzini, is a joy to see and a joy to shop in. 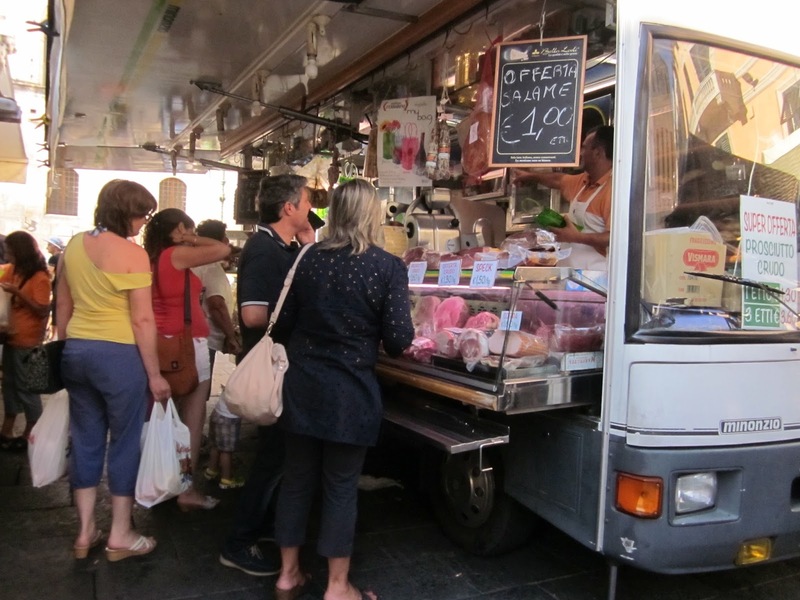 It continues a long tradition of selling food in open-air food markets that dates back to the days of the Romans, and even earlier. There isn’t a lot of difference between the markets in early Rome and the Chiavari fruit and vegetable market today. Vendors still have to have a license to sell, although licenses today are not engraved on a piece of marble and publically displayed as they were in early Rome. Women still do most of the shopping, that has not changed, but in ancient Rome rich women would often send their slaves to do their marketing. Fast food that could be eaten straight away was also a common sight in Rome. Bread, hot sausages, pastries, and chickpeas were perfect for busy Romans to eat on the street or take home. While we still buy bread and pastries from specialty bakeries, other ready-to-eat food like cheese and salami, roasted chickens and seafood salad are sold in the market from movable food trucks that travel from town to town not just in Liguria but throughout Italy. The Romans would have been impressed. 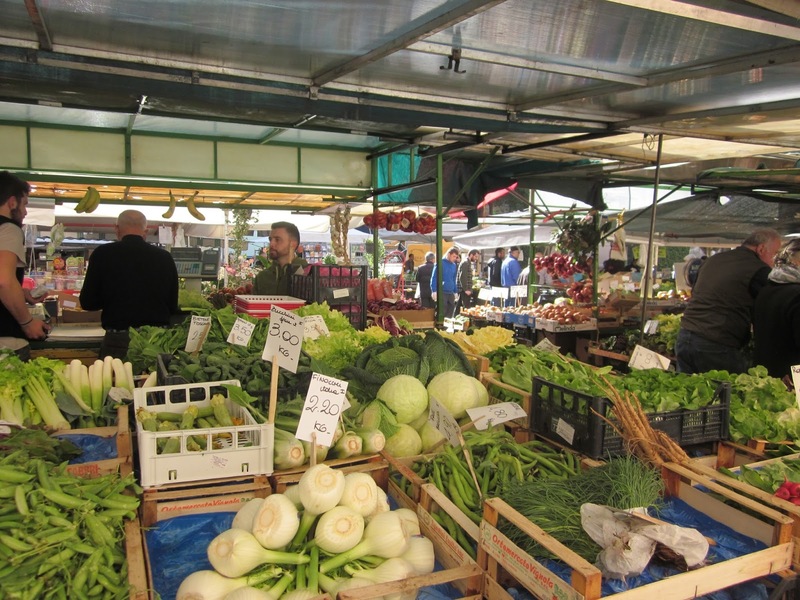 Just as the Roman government set weights and measures around the city and employed inspectors to protect buyers from being swindled, today’s street markets are also controlled by local authorities. Fennel and Cabbage and Onions, Oh My! Suspicious upper class Romans thought the vendors were deceitful and always questioned the quality of the food being sold. Some even went so far as to accuse vendors who sold prepared foods of selling human flesh in place of pork in some of their cooked dishes. It was generally believed that human and pig flesh taste and smell remarkably similar, and unsuspecting customers were not able to tell the difference. That accusation was never proven, nor was the question as to where they would have gotten hold of human flesh, but nonetheless it did create a buzz in Old Rome for a while. A fifth-century AD author also claimed that some vendors displayed food items such as eggs and onions floating in glass bowls of water so that they looked larger than their actual size. It sounds rather silly even for those times, and mostly likely is not even true since food back then, just as it is now, is sold by weight. Most people in the Roman world were farmers. They grew wheat and barley, olives, grapes, apples, onions and celery and other vegetables. Unlike our markets today, which rely on a central distribution center for their produce, most of the vendors in Roman times sold what they grew. And they paid taxes, as farmers do today except Roman farmers paid their taxes partly in money and partly in food. The markets of early Rome and those today are more alike than they are different. 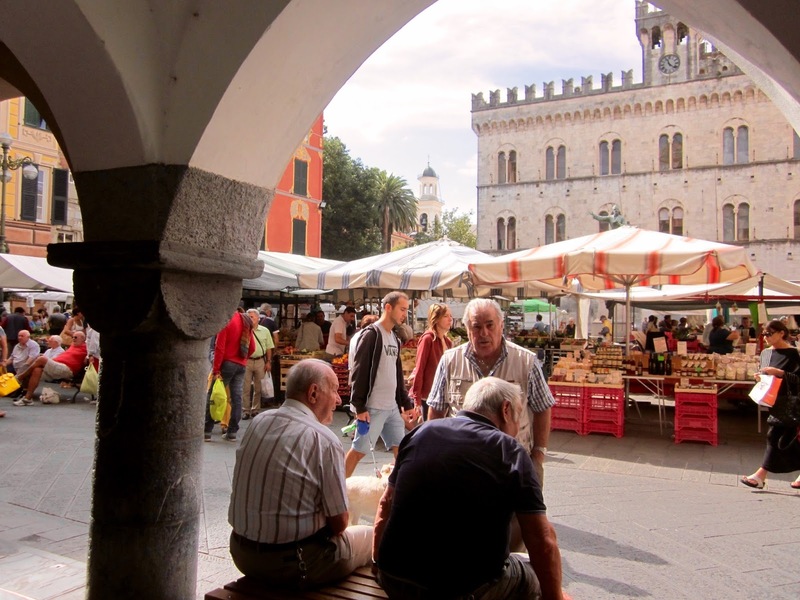 However, one of the biggest differences between the Roman vendors and the vendors in Chiavari, is that the Roman vendors made a lot of noise. They would hoot and holler and call out to passersby to come and look at the beautiful fruits and vegetables they had for sale. 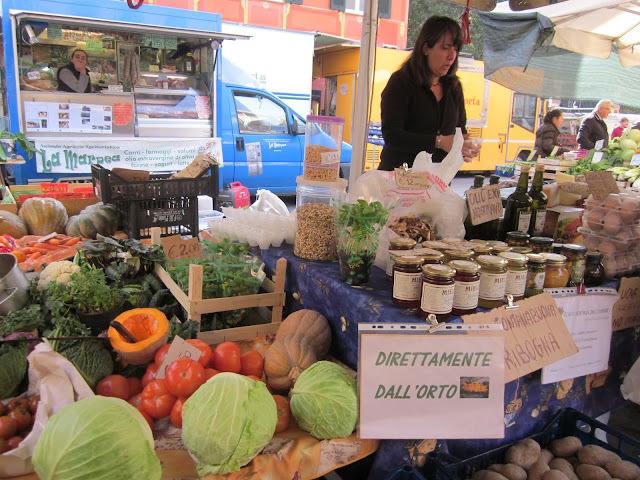 I think there are some open-air markets here in Italy where they still hoot and holler, but I’ve never seen it. I remember the Italian market on 9th Street in Philadelphia as being rather raucous, but the markets in Milan and other towns in Lombardy as well as here in Liguria are surprisingly quiet. 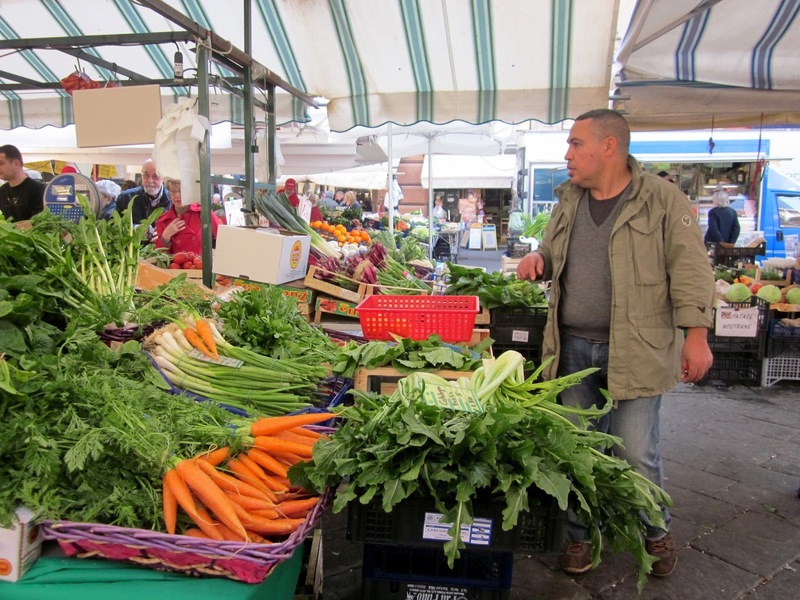 Another similarity is that street vendors in the Roman markets, sold produce and food at relatively low prices, but wealthy shoppers, who wanted to impress their dinner guests, could visit the macellum, Rome’s luxury food market. At the macellum large fish were auctioned off to the highest bidder, which often resulted in the customer paying incredibly high prices. 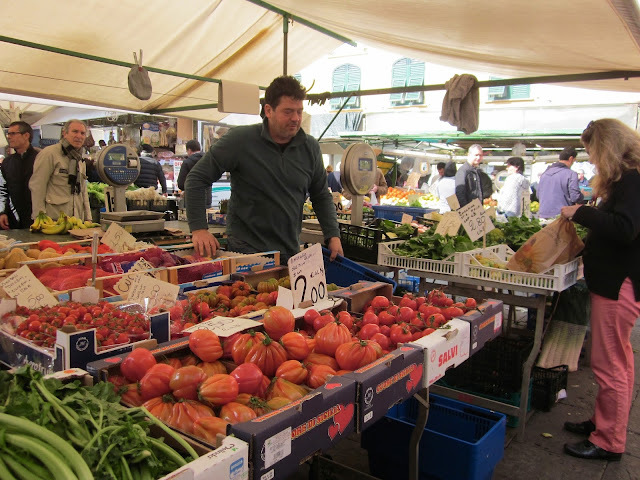 It brings to mind the fruit and vegetable stand in Genoa Nervi we used to call Tiffany’s because of their high prices, and also Pecks in Via Spadari in Milan, whose prices are so high they don’t even post them on their on-line store. But unlike today, if the Romans hadn’t brought enough money to pay for their purchases, bankers were always on hand and more than happy to lend money to anyone who could not cover the costs of their extravagant shopping spree. The imperial biographer Suetonius records the disgust of Emperor Tiberius that three red mullets sold for 30,000 sesterces – more than 30 times the annual wage of a Roman legionary soldier. Other Roman delicacies available from that luxury market included songbirds, snails and dormice, a dormouse being a tiny creature that weighs at most 180 grams or 6.3 ounces, and sleeps six months out of twelve. Errr, Excuse Me, Do You Deliver? Perhaps the biggest difference between then and now is that in ancient Rome vendors would often go directly to the homes of the wealthy. The Roman poet Ovid complained that the visits by the vendors were a nuisance for lovers since they always seem to knock at the door when their mistresses were in a buying mood. To add insult to injury, the vendors would look to the lovers to pay the bill, and if they didn’t have enough cash, no problem, they would take a note of credit. But it wasn’t always about the money, there was also the fear that the mistress would find the vendor more attractive and send the lover on his way. While it was a different time, and a different place, it’s surprising how many traditions have survived the centuries. Since that time both Italy and Sicily have been invaded, and dominated, by so many who have left their mark on this country, but the truth is they were never able to change the heart and soul of what it means to be Italian. That always seems to survive.